Can solar lights outperform the competition? We tested solar security and garden lights to see if they’ve got what it takes to provide a safe level of light for your paths and entranceways. We also tested their competition: 12V wired-in garden lights and mains-powered sensor security lights. And we’ve got some top tips from one of New Zealand’s leading landscape designers on the best way to illuminate your outdoor areas. Bottom line: This 12v spotlight has OK light output and OK water resistance. Bottom line: This 12v spotlight has excellent light output and very good water resistance. Bottom line: This solar floodlight has poor light output for a solar light and very good endurance. Bottom line: This 12v bollard has excellent light output and poor water resistance. Bottom line: This 12v stick light has OK light output and very good water resistance. Bottom line: This 12v bollard has very good light output and poor water resistance. Bottom line: This mains twin lamp has extremely poor light output and very good water resistance. Bottom line: This solar sensor floodlight has OK light output for a solar light and good endurance. Bottom line: This 12v spotlight has very good light output and poor water resistance. Bottom line: This mains twin lamp has OK light output and very good water resistance. Bottom line: This solar sensor twin lamp has just OK light output for a solar light and very good endurance. Bottom line: This mains twin lamp has very good light output and very good water resistance. Bottom line: This solar stick light has poor light output for a solar light and excellent endurance. Solar garden lights stake into the ground and use a built-in solar panel to charge their batteries during the day, before being activated by a light-sensor once night falls. 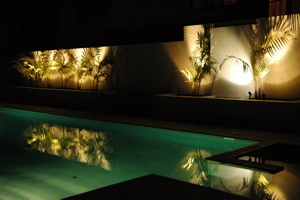 Solar security lights are mounted on a wall and designed to illuminate entranceways. They generally include a motion sensor, and a separate solar panel connected to the light via a long cable so the panel can be mounted where it will be exposed to the most sun, for example on a garage roof. They aren’t as bright as wired-in security sensor lights, but they can be a good option to avoid the expense of running electricity to areas remote from your home’s mains supply. 12V garden lights are powered from a transformer which plugs into a mains socket, and reduces the mains voltage from 230V to 12V. Using low voltages means the cables don’t need to be buried, as they don’t pose an electrocution risk if accidentally severed. Mains sensor security lights are the traditional motion-sensing outdoor lights, and often come as twin lamps allowing you to illuminate large outdoor areas. They’re invariably brighter than solar security lights, but they need to be installed by an electrician and can be very expensive to install if you need to run new wiring where you need the light. We found the brightness of solar garden lights lagged behind their wired-in counterparts, but if your outdoor areas get a good amount of sun during the day there are a couple of options we recommend, both from Duracell: the Duracell Solar LED Pathway Light RS84 ($40) and the Duracell Solar LED Spotlight SS15P ($18). Their installation is also much less of a chore than for 12V lights, which require you to string cables through your garden from a transformer connected to an outdoor power supply. The Duracell spotlight was the only solar garden light to deliver more than the minimum light level of 40 lux recommended for New Zealand workplaces (no residential minimum lighting standard exists). However, the beam is focused in one direction so it can be difficult to get good coverage of a walkway. The Duracell Solar Path Light provided only 24 lux, but it emits light in every direction from its lens. This 360-degree light is a better bet for illuminating paths, while the spotlight is good for highlighting individual objects. Both recommended Duracell solar lights showed impressive endurance. They shone all night after seven hours’ charging on a sunny day, with no significant reduction in brightness. After a cloudy day they were still fairly bright in the evening, but they were just about extinguished by dawn. The rest of the solar garden lights, which sell for less than $10 each, returned poor performance. The next best model produced only a quarter of the light of the Duracell path light. Most of them only just met the Building Code requirement for emergency exitways, a low bar of one lux, and then only for a few hours after dusk. That’s enough to show you where the path leads, but not enough to highlight steps, changes in height or other tripping hazards, so they’re not a safe option. The 12V garden lights we tested returned mixed results. Models with the highest light output fared poorly in the water resistance test. The only 12V light to have good performance across the board was the Accent 12V Stainless Steel Spotlight ($89, Lighting Plus exclusive). However, all the 12V lights were much brighter than their solar equivalents. They’re also a more long-term solution – after a year or two the performance of solar lights will degrade as their rechargeable battery wears out. Good quality stainless-steel or copper 12V lights should last five to 10 years in your garden, though you’ll need to occasionally change the bulbs if they use halogens (LEDs have a far longer lifespan). We think they’re a better bet for keeping your paths navigable at night, but the Duracell solar lights are a good option to avoid the hassle of installing a 12V circuit in your garden. Planning is crucial when installing 12V lighting. Work out what lights you need and where: bollards/stick lights are good for lighting garden paths, spotlights are for featuring objects, while deck lights lie flush in decking. Once you’ve chosen your lights, add up all their wattages. For example, if you’re buying five 20W lights your total wattage will be 100W. The next step is choosing a transformer. This plugs into your outdoor power supply and reduces the 230V from the power point to 12V. They generally come in the following sizes: 22W, 60W, 150W, 220W, 400W, and you need to choose one with a higher wattage than the total drawn by your lights. So for our 100W example, you should buy a 150W transformer, which will set you back about $90. Finally, buy your cables. Measure the total distance from your outdoor power supply along the paths your cables will follow, then buy five to 10 metres more 12V cabling than that. Never run more than 35 metres of cabling from your transformer. The transformer will come with a cable to plug into the mains, but you’ll need a primary 12V cable to run from the transformer into the garden, which will have a number of evenly spaced connectors to which you can attach the lights. You can attach smaller lengths of cable if you want to run lights further from the mains cable, or splitters to connect two runs of lights to one mains cable connector. Note the connections used by your lights – they’ll either be press-in or two-pin. You can also connect timers to the circuit to automatically switch the lights on in the evening. Alternatively, you can add sensors to save power by only activating them when required. As with garden lights, the solar security sensor lights we tested aren’t as bright as mains-powered models. But as long as their panel gets a few hours of sun during the day, their endurance is very good. They’re worth looking at if you’re keen on avoiding expensive electrical installation and you’re not illuminating a large area. Two solar sensor lights returned admirable performance in every test category. The Arlec Solar LED Floodlight with Sensor MAL633 ($89, Bunnings exclusive) and the HPM LED Solar Security Light RSSL605/2 ($137) each produce more than 150 lumens. After a sunny day we were able to activate them 20 times (for just over a minute each time) without a noticeable reduction in brightness. They have separate solar panels that can be placed anywhere within five metres of the light (the length of cable supplied), meaning you can fit the lights in shady areas and place the panel on the roof. However, their light output is far behind the mains-powered models, which were four times as bright on average. That said, installing electricity to areas where you don’t already have it can potentially cost thousands of dollars. For this reason, we have a lower bar for recommending solar sensor lights than with mains models. The best of the mains sensor lights is the Arlec Security Sensor Floodlight Par38 MAL114 ($18, Bunnings Exclusive). It isn’t the brightest light we tested, but it’s easy to install and watertight. The brightest on test is the Orbit Lighting Twin LED Sensor OSLBLED ($41), but it let in some water when we hosed it down, and we found it trickier to install. 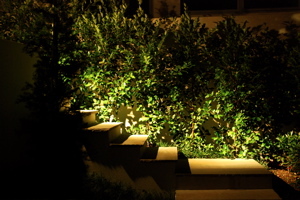 Jenny Pullar is one of New Zealand’s leading landscape lighting designers. She’s won multiple awards for her designs and has served as lighting judge at the Ellerslie International Flower Show. Jenny says the key thing to remember is that light travels in straight lines, and won’t have any effect until it hits a solid surface (which may be your eyeball, causing glare). She recommends using a surface mount for your garden lights rather than staking them in the ground, which can result in lots of light flying off into the ether instead of illuminating the path as intended. “The first thing I’d do is see if there’s a fence or anything up high so that I could shine light down. But stake-in lights can be a good option if there’s no high surfaces available for mounting,” she says. Her design process starts with a walk around the garden at night with some sample lights to see which fixture locations and beam directions are most effective. 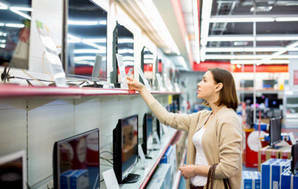 She recommends “playing around with a torch or single garden light to see what’s going to work before you go out and buy a whole range of expensive lights”. Jenny emphasises the importance of light colour, which ranges from the warm yellow light emitted by old incandescent bulb to the cool white typical of office lighting. She advises that, in contrast to indoor living areas where a warmer light colour is preferred, the best option outdoors is cool light. “It looks more like moonlight. Warm [yellow] light draws attention to earthy tones like bark and dirt, while cooler colour temperatures bring out vibrant colours like green lichen or the red of a Pohutukawa tree,” she says. Most outdoor lights will come with bulbs/LEDs with a cool colour temperature, but when buying replacement bulbs check the colour temperature – measured in Kelvin (K) – is what you’re after. Cool white light is 4000K while warm white is 2700K-3000K.